In early January it was announced by the Social Development Unit that a proposal for legislation on the issue of Occupational Safety & Health was accepted by the Interim Legislative Coordinating Committee. The next step is to bring it to the community at large through the new Community Decision Making Process. It is at this stage where Community members will have final approval on whether such legislation should even be created. If the community gives the go-ahead, the actual creation of the law will then take place with the full participation and approval of the Community, through consensus. Why propose this new law? It is the LAW in Quebec that all employers MUST provide and pay for workers compensation coverage for all their workers. Commission de la Santé et de la Securité du Travail (CSST) is the provincial organization responsible for workers compensation. 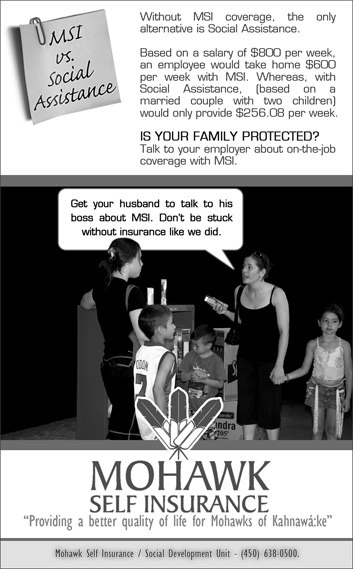 Mohawk Self Insurance (MSI) is the organization responsible for workers compensation in the Territory of Kahnawà:ke. At a 1981 community meeting, the Community decided that it was time for the MCK to develop their own workers’ compensation and oust CSST. This was done and in 1984, Mohawk Self Insurance was born. Until recently, MSI has operated freely without interference from the Quebec Government. Of late, the political climate has changed between Quebec and Kahnawá:ke, specifically in the area of Workers’ Compensation. The three year multi million-dollar Mercier Bridge Restoration Project has raised the jurisdictional issue between CSST and MSI. For a very long time, CSST has turned a blind eye to MSI and Kahnawá:ke. However, that is no longer the case. CSST has been attempting to flex its jurisdictional muscle with thinly veiled threats of certain actions that could have a profound impact on jurisdictional issues, premiums, service and benefits of MSI. CSST now insists that the MCK and all Kahnawá:ke businesses return to CSST and fall under their jurisdiction and inspections. If this occurs, it would mean that all businesses within Kahnawá:ke will be assessed a CSST premium fee and the return of CSST jurisdiction to Kahnawá:ke. These actions have sparked the Social Development Unit to propose the creation of a law where Mohawk Self Insurance would have sole jurisdiction within the Territory of Kahnawá:ke. 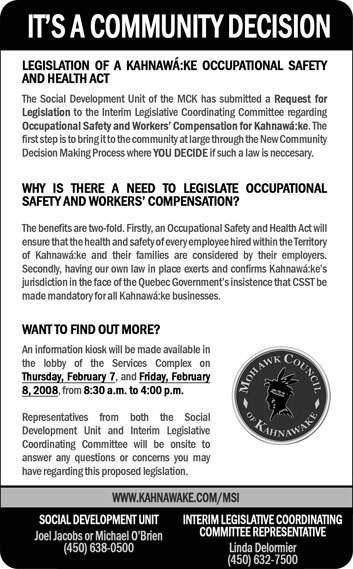 How will a Kahnawá:ke Occupational Safety & Health Act help? Designed for the well being of the Community, the proposed law will be a means for the average Kahnawa’keró:non to have access to a complete Health and Safety program. The program will protect workers and employers in the event of work related injuries, death and occupational diseases within the Territory of Kahnawá:ke, while exerting and confirming our jurisdiction on our Territory. By providing insurance coverage to the worker, their spouse and children in case of a job related injury or death. Premiums are paid by the employer, NOT by the worker. There is no cost to the worker for this very vital coverage as it is the responsibility of the employer to protect their workers. 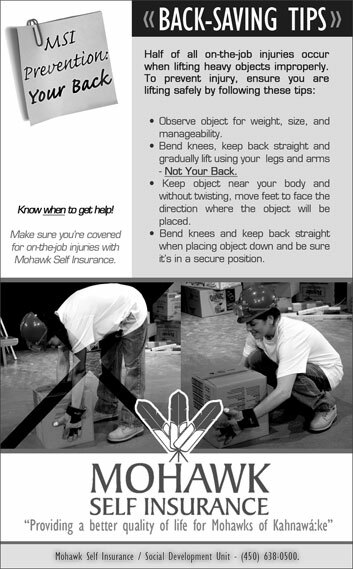 Safety and accident prevention information, as well as health and safety inspections will also be provided to both workers and employers. How will this proposed law be ratified? It is the Community’s decision to first decide if this proposal should become law. If the proposal passes this crucial first stage, the Community will then take on the task of creating the content of the law. Using the new Community Decision Making Process, the Community will be involved at every stage in the creation of this law with final approval coming by way of consensus. A system of insurance that pays a weekly income replacement to an employee for an injury incurred during the course of employment. Also referred to as “workers' comp”, this simultaneously protects the employer from possible litigation. 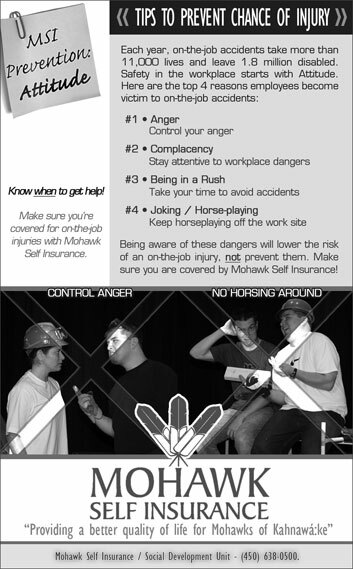 As you may or may not know, many employers in Kahnawá:ke do not protect their workers with any kind of insurance plan coverage. The same can be said for employment insurance coverage and other benefits. This means that if an employee who has been working for an employer for a long period of time is suddenly laid off, quits or gets fired, that worker is ineligible to receive any type of benefits and will likely be forced to rely on Social Assistance. The worst-case scenario would be an employee being severely injured at work and having no coverage or benefits. How then will that worker and his family support themselves? 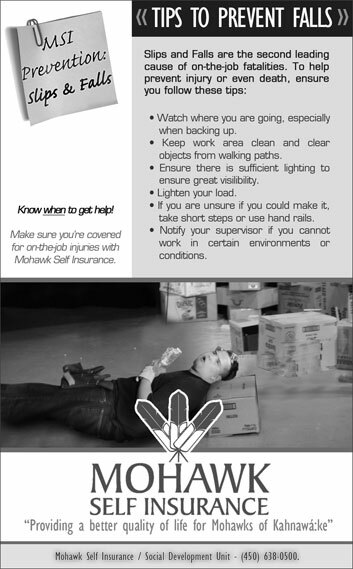 It is also the responsibility of the worker to ask their employer if they are covered for “on the job injuries”. 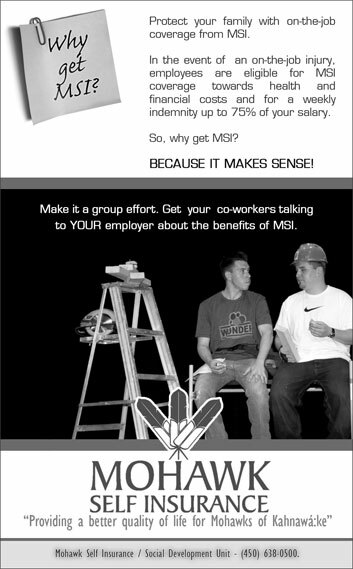 MSI is specifically designed for Kahnawa’keró:non by Kahnawa’keró:non to protect injured workers, their spouses and children. The premiums are lower and the benefits paid out are higher. The service is superior with a faster response time, more personalized attention and without taxation issues. Best of all, it belongs to the people of Kahnawá:ke, keeping the Provincial Government off of our Territory and out of our businesses. Without worker’s compensation, an injured worker with a wife and kids, mortgage, car payment and all of life’s other expenses would likely be forced to apply for Social Assistance (welfare). Social Assistance provides a maximum of $258.06 per week. 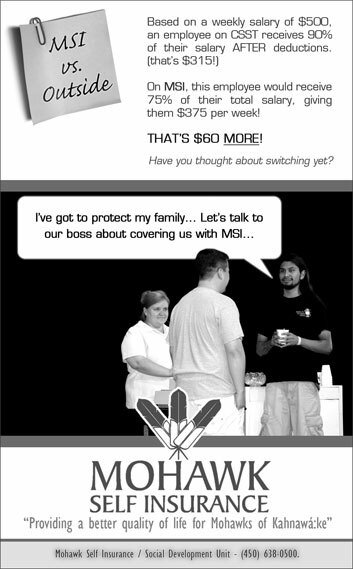 Up to a maximum of $894.23 per week from MSI. If that same worker was on CSST, they would be forced to pay taxes on their benefits because there is NO provision for tax exemption for Native workers covered by CSST.